Create unique prints on Chromaluxe aluminum panels with a high gloss finish and a luminous quality. Metal printing is just that - printing on Metal. We use a special high heat sublimation process resulting in images that have an amazing depth. These prints have a similar lifespan to traditional photographic prints. 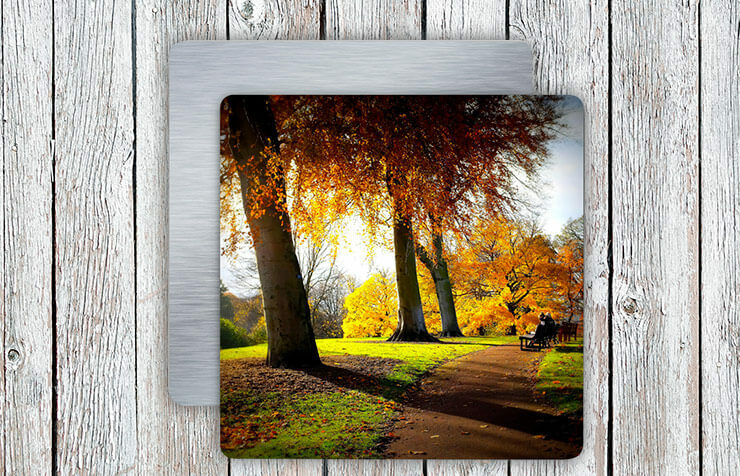 The Vibrant Glossy Metal prints have a white backing resulting in a traditional look, while the Brushed Metal Glossy print allows the brushed metal to show through on lighter areas of the image. All prints come ready to hang with smaller sizes having the option to come with an easel stand in place of a wall hanger.